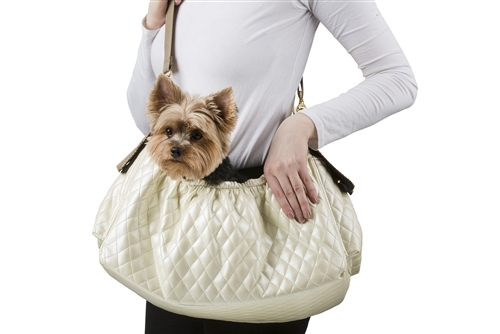 Newly designed Gigi Sling by Petote is a delight to use for small dogs for fast errands around town. The wide open top and shallow depth (only about 6" high at rest) are perfect for seasoned dogs who know the drill. There's an elastic band running through the top to provide styling and keep the perfect shape while in use by the removable, and adjustable padded shoulder strap. 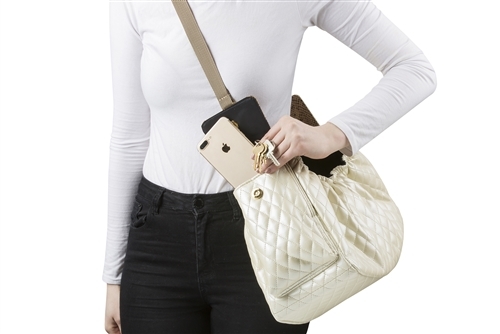 Each end of the Gigi Sling features a large pocket some 9 inches deep to hold your necessities, and is accessed through a patent leather flap with a magnetic snap. The semi-rigid bottom is sturdy enough to hold dogs up to approximately 8 or 9 pounds, and includes a removable soft and comfy faux-fur bottom panel with canvas backing.